For whatever reason – hope, I imagine – people still think they’ll be seeing Half-Life 3 in their lives. If I’m honest, I’ve given up on ever seeing Gordon Freeman again, and I’m rather rapidly running out of reasons to keep caring. And then Valve just goes and gives us a new one: Virtual Reality. 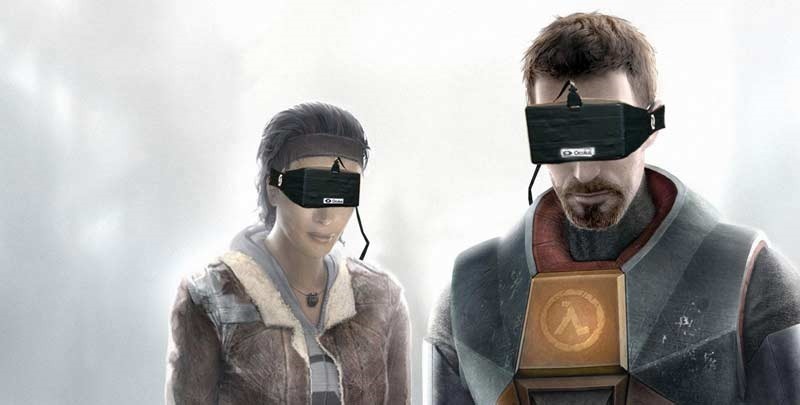 While many expected a VR Half-Life 3 announcement from GDC, that hasn’t happened – but Valve’s not ruling it out. “We’re not saying, ‘no’ but we don’t know what the right thing is [yet],” Valve programmer Jeep Barnett told Kotaku when asked about a VR Half-Life 3. Valve has, naturally, experimented with Half-Life assets while mucking about with their VR system – but that doesn’t necessarily mean a new Half-Life is coming – much in the same way that their new Aperture Science VR demo doesn’t mean we’ll be seeing a Portal 3. We’ll probably not be seeing anything ending in a 3. “So yeah, we’ll grab some headcrabs, we’ll grab the machine guns from Half-Life, the rocket launcher – all those different fun things – and see how they play in VR,” Barnett said. “But right now, it’s a tool for exploring the different kind of game designs we want to do. I’m still rather sceptical about Virtual Reality – as it’s a gimmick that we’ve seen resurface every decade or so. This time though, the technology is in place to make it a viable thing for homes, and with so many manufacturers and platform holders backing the technology, this time could be the one.